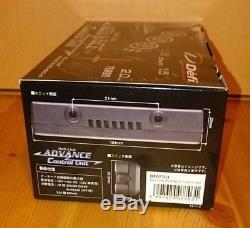 Defi DF07703 Control Unit For Defi-Link ADVANCE A1 BF CR ZD F/S from JAPAN. 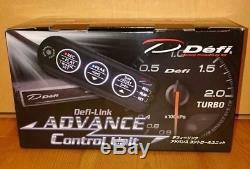 Defi-Link ADVANCE control unit is necessary to operate ADVANCE CR, ADVANCE BF, ADVANCE ZD. All ADVANCE system settings and operations are performed with this ADVANCE control unit. Adoption system (two-way communication) adoption. Defi-Link Meter ADVANCE CR, ADVANCE BF, ADVANCE ZD together for up to 7 centralized operations. With nighttime lighting (white) remote control switch allows hand operation. 2 types Production in the possible opening and ending modes. Additional meters for the second and subsequent instruments are only for connection between the meters and from the sensor to the advanced control unit. Power indicator on the front of the control unit. Warning value (optional) Warning (buzzer sound can be set ON / OFF) in synchronization with warning LED (red), synchronized with warning LED (red). Record running data (peak value during running, warning setting value) for up to 3 minutes, Can be played. Differential pressure display on fuel pressure gauge by connecting fuel pressure gauge and turbo meter. Packing size 22.9 x 12.7 x 12.7 cm. Please let me know if you have any questions. Also, please tell me if you have what you're looking for in Japan items. International Buyers - Please Note. These charges are the buyers responsibility. The item "Defi DF07703 Control Unit For Defi-Link ADVANCE A1 BF CR ZD F/S from JAPAN" is in sale since Tuesday, March 14, 2017. This item is in the category "Consumer Electronics\Vehicle Electronics & GPS\Other Vehicle Electronics". 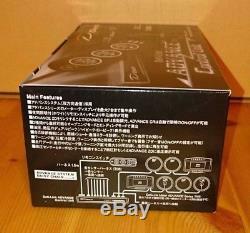 The seller is "japanderful" and is located in Tokyo, setagaya.